As our VoIP experts help customers solve VoIP questions along the way, we noticed that there are some common misunderstandings about VoIP that create unnecessary apprehensions when switching to a VoIP system. 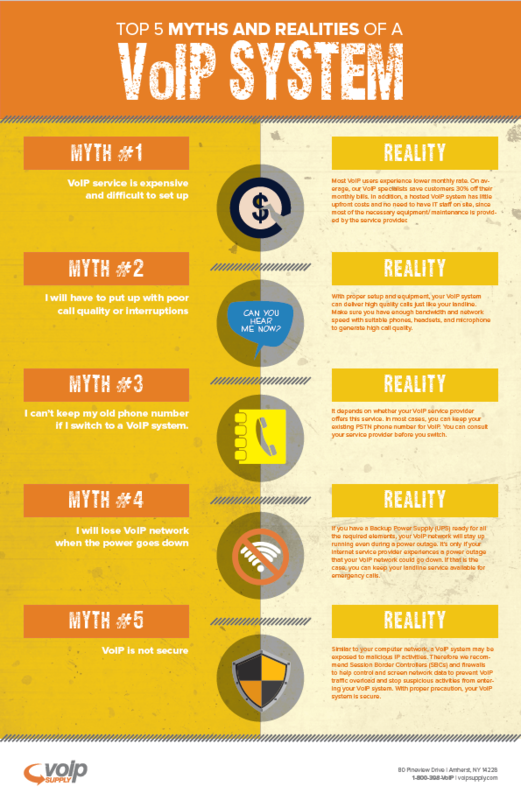 Therefore, we’d like to speak to the top 5 VoIP myths to help you understand the reality of VoIP. Myth#1 VoIP service is expensive and difficult to set up. Reality: Most VoIP users experience lower monthly rate. On average, our VoIP specialists save customers 30% off their monthly bills. In addition, a hosted VoIP system has little upfront costs and no need to have IT staff on site, since most of the necessary equipment/ maintenance is provided by the service provider. Myth#2 I will have to put up with poor call quality or interruptions. Reality: With proper setup and equipment, your VoIP system can deliver high quality calls just like your landline. Make sure you have enough bandwidth and network speed with suitable phones, headsets, and microphone to generate high call quality. See VoIP Network Checklist for more information. Myth#3 I can’t keep my old phone number if I switch to a VoIP system. Reality: It depends on whether your VoIP service provider offers this service. In most cases, you can keep your existing PSTN phone number for VoIP. You can consult your service provider before you switch. Myth#4 I will lost VoIP network when the power goes down. Reality: If you have a Backup Power Supply (UPS) ready for all the required elements, your VoIP network will stay up running even during a power outage. It’s only if your Internet service provider experiences a power outage that your VoIP network could go down. If that is the case, you can keep your landline service available for emergency calls. Read more: When the Power Goes Out, Does the VoIP Network Stay Up? Myth#5 VoIP is not secure. Reality: Similar to your computer network, a VoIP system may be exposed to malicious IP activities. Therefore we recommend Session Border Controllers (SBCs) and firewalls to help control and screen network data to prevent VoIP traffic overload and stop suspicious activities from entering your VoIP system. With proper precaution, your VoIP system is secure. See more suggestions to make your VoIP system secure. What are your concerns about VoIP? Leave a comment below to tell us!